When did Orientalia, the New York bookstore that fuelled the appetite of John Cage and many others for the Far East, close? Google, for once, fails to provide the answer, and I ask because in 1978 I stumbled across a store in New York that sold books about the Orient that were almost impossible to find in London at the time. Could the store have been Orientalia? Or had it long closed? Buddhist author and teacher Stephen Batchelor explains that "A Zen garden can say as much about what the Buddha taught as the most erudite treatise on emptiness", and in that New York store - Orientalia or other - I found a book on sharawadgi‏ - borrowed scenery - that started a longterm fascination with the 'pure land' of traditional Japanese gardens and the culture that created them. Like many in the 60s the counterculture had led me to Indian mysticism. But my searches led me further East to Kyoto, the ancient capital of Japan, which I visited in the 1980s. There I experienced that searing mix of extreme conservatism and radical questioning that is Zen and which finds expression in the famous rock garden at Ryoan-Ji Temple. Since then Japanese gardens have been a feature of our houses. A glimpse of the one at our present home in Norfolk appeared in my first post about Jonathan Harvey back in 2007, while a later post featured a recording of Jonathan's music which includes his ...towards a Pure Land, a work described by Michael Downes in the sleeve note as pointing "...towards the possibility of still greater beauty in the future, both musical and spiritual..."
Another garden in Kyoto, that of the Saiho-ji Temple designed by the 14th century Zen priest Muso Soseki, inspired the Japanese composer Toru Takemitsu (1930-1996) to write his Dream/Window for orchestra. That work was one of Takemitsu's orchestral works recorded for Denon by the Tokyo Metropolitan Orchestra conducted by Hiroshi Wakasugi in the early 1990s. Also on the discs was Spirit Garden which uses a twelve note row to generate three chords each of four notes, with these sound 'objects' being heard in a sonic garden from different perspectives. Re-issue specialists Brilliant Classics have released the Takemitsu orchestral works at sub-budget price. The two disc set provides an excellent introduction for newcomers to the composer's music, but are also a valuable resource for Takemitsu-philes as they contains the rarely heard November Steps for orchestra and two traditional Japanese instruments, the biwa and shakuhachi, and Gémeaux for oboe, trombone, two orchestras and two conductors with Christian Lindberg as trombone soloist. The notes for the Brilliant Classics release are provided by Takemitsu himself, and in his note for Dream/Window he describes how "beneath the hushed serenity of Kyoto, the gears of change grind on and on without cease". 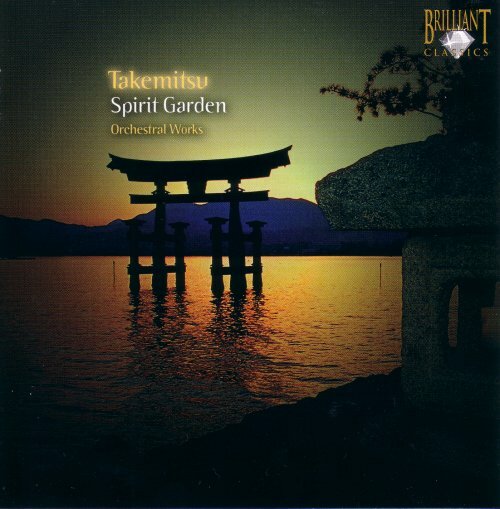 It is Takemitsu's unique ability to blend the hushed serenity of Zen gardens with the ceaseless change of contemporary culture that makes his music so special and which also make this Brilliant Classics re-release of his Japanese remixes so recommendable. Max Hole, chief executive of Universal Music, recently presented his vision for classical music. In an earlier post I countered these proposals by saying “we should stop apologising for the way we present our sometimes challenging but always inspiring music, and instead be much more confident and bold in the way we programme and champion it”. This is the first in a short series of posts about new music that can - if programmed confidently and championed boldly - spread the classical dharma to a new audience far more effectively than dressing-down and dumbing-down. And it is not without significance that all my examples will come from CDs released by independent record labels.